Kobe Grand Hotel on Nishimachi (西町), also known as Division Street, in Kobe, Hyogo Prefecture. The hotel was conveniently located near the Meriken Hatoba pier, Kobe’s point of entry. 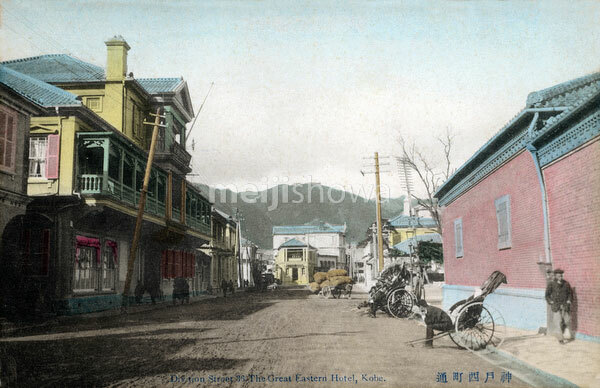 It opened as Great Eastern Hotel (グレイトイースタンホテル) around 1902 (Meiji 35) and soon after changed owners and name. The hotel featured a distinctive balcony on the second floor which must have impeded on the guests’ privacy.